This week's international fixtures took place during the month of Ramadan, when Muslims worldwide observe a month of fasting. Managers of teams comprised mainly of Muslim players have had to work around the majority of their squads fasting from dawn until dusk. Ramadan coincided with the 2012 London Olympics, the 2014 Fifa World Cup, and last year's European Championship in France. With the long summer days in Europe, the quality of player performance can be an issue. During London 2012, the Emirati football team received special dispensation from the country's highest religious authority not to fast on match days. Germany's Mesut Ozil also elected not to fast during his nation's World Cup campaign in Brazil. Others insisted on fasting. Many members of Algeria's national football team fasted during their last-16 match against Germany, despite receiving special dispensation from religious authorities, although goalkeeper Rais M'bolhi subsequently broke his fast with some dates and water at half-time. It is the ninth month of the Muslim year, during which strict fasting is observed from dawn to sunset. Muslims believe any positive actions bring a greater reward as the month has been blessed by Allah. Some will pray more, while others will read the Koran - the central religious text of Islam - more frequently. The date changes, moving back about 11 days every year. The festival of Eid is celebrated at the end of the period of Ramadan. This year, Ramadan stretches from 26 May to 24 June and many national teams across Asia and Africa have delayed kick-offs until well into the night. The Asian Cup qualifier between Palestine and Oman on the outskirts of Jerusalem earlier this week was one fixture that posed extraordinary challenges. The Palestine Football Association had originally scheduled Tuesday's match to start at 9.45pm local time, then moved it back to 10.45pm, and again to 11pm. Scheduled to give the team and its fans the opportunity to break fast before heading to the stadium, it inadvertently created a headache for fans outside the Jerusalem/Ramallah area. 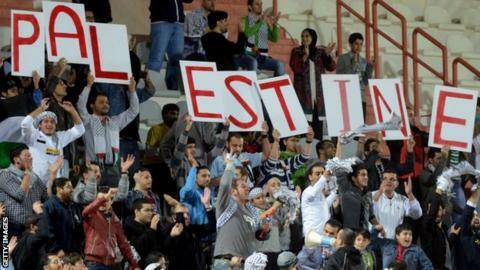 The Palestine FA tried to coax fans into attending by granting free entry, but with people from the far northern and southern reaches of the West Bank, as well as Palestinian majority cities in Israel, needing more than two hours to commute to the match, there was always a worry not enough would be present. From a preparation standpoint, both Oman and Palestine moved workouts and training to night-time hours, while also adjusting diet and conditioning habits accordingly. Bader Aqel, one of the Palestine physicians, outlined the adjustments made to the national team's routine during Ramadan. "We stress to the players that they drink at least three litres of water after sunset to fight against the effects of dehydration." Outside of Ramadan the players would be offered a buffet-style spread at their team hotel - but this week Aqel and the rest of the medical team carefully monitored the players' intake, giving them set plates to prevent overeating. The players were served equal parts carbohydrates - such as white rice - lean protein and mixed greens or salad. The menu was designed to give players easily digestible food and energy for the match. Often the coaching staff would send the players to the gym one hour before Iftar - the meal that commences immediately after breaking the fast - to jolt metabolisms after a day of relative inactivity. "The most important thing is for players not to remain too sedentary during the day," added Aqel. "We want to avoid having the players sleeping too much [which is a common occurrence during Ramadan]." Palestine's training sessions took place at 11pm, after which the players returned to their hotel for ice baths and physio work before sitting down for a pre-dawn meal at about 2:45am. Pim Verbeek - the Dutchman in charge of Oman - has previously faced similar challenges with Morocco's Under-23 team and has adapted his training sessions to suit his players. "Of course it's different. You train once a day, you would ideally like to train twice a day," he told BBC Sport. "Our evening sessions have been good and we're saving energy for the game." Reading goalkeeper Ali Al Habsi is Oman's captain. He thinks the late-night kick-off is ideal for the players - giving them enough time to replenish and rest their bodies after a 17-hour fast that starts at 3:50am and continues until 7:45pm local time. "The two-week period in camp has helped us get used to this. We have trained at the same time the match is due to take place, so this should help us overcome any challenges presented by Ramadan," he said. Al Habsi is the only player on either side to have had to make a decision on whether or not to fast while playing a club game. In his 14 years in Europe with Lyn Oslo, Bolton Wanderers, Wigan Athletic, and Reading the issue has only occurred once - during Reading's Championship play-off final against Huddersfield Town last month. Al Habsi, a former fireman, elected not to fast. Palestine's routine, as opposed to Oman's, was not the same for all the players in camp. Five of their squad were born outside Palestine - four from Chile's 500,000-strong, mostly Christian, Palestinian community, and Jaka Ihbeisheh, who was born to a Slovenian mother and a Palestinian father and does not fast. For these players, breakfast and lunch remained part of their routine at Ramallah's Palestine Plaza Hotel, and none shared a room with a fasting player. While most players in the squad battled hunger and thirst during the day, the five non-fasting players were more focused on battling boredom - toiling away at the gym to kill time. Some adapted their routines to match their fasting team-mates - staying up until the early hours and sleeping until noon. The pre-dawn meal of Suhoor, served on the top floor at the hotel's revolving restaurant, became an opportunity for players to bond and share jokes after training, ice baths, and physio work. And by Tuesday's match, both sets of players were used to their adjusted routines. The game, played under the floodlights at the Faisal Al-Husseini stadium, attracted 11,000 fans - about two-thirds of the stadium's 18,000 capacity. Jonathan Cantillana headed a deserved opener for Palestine before Yashir Pinto Islame struck from the edge of the area to double the advantage. Oman pulled a goal back before the break through Ahmed Mubarak, but could not find an equaliser. Palestine's Yashir Pinto Islame was named man of the match - and paid tribute to the strategy put together by the coaching staff to help the team cope with fasting. "We adjusted the training because of the players who were fasting - and the coaching staff did a fantastic job. In the game, we ran a lot. "It was a new experience for me but it wasn't that different, to be honest." 7:45pm: Time for Iftar - the meal eaten after sunset. Players break their fast with a small meal. Water and dates come first and then a clear broth soup containing either vegetables or freekeh - a popular local grain. The main meal is a grilled chicken breast, white rice, and fattoush salad (without the fried bread) or Caesar salad. 9:00pm: Players continue to take on water before training. Midnight: Training ends. Players continue to take on water. 2:00am: Players meet again after showering and physio work. Suhoor - the pre-dawn meal - is served buffet-style. Players have their choice of fresh fruit, yoghurt, corn flakes, boiled eggs, olive oil, za'atar, bread, dried fruit, and juice. 10:00am: A small contingent of non-fasting players meet for breakfast - made-to-order vegetable omelette is the most common choice. 3:00pm: Non-fasting players meet at the hotel restaurant for a light lunch consisting of salad and chicken. 7:45pm: Iftar, the last one before the big match. A small plate of chicken and spaghetti on the menu. Fruit for dessert. 9:15pm: Players leave team hotel.